Last Thursday I took a PTO day off of work, a mental health day. I decided to go to the Dallas Arboretum in the morning and hang out for a while. We have a membership there, so I don’t have to pay for parking or admission, which is nice. Especially nice because I can go at my leisure and simply relax and walk around, not feel any pressure to get my money’s worth. For that, I can always come back another time. The Chihuly Exhibit is still up, and will be until November. It is a beautiful as always – and now, since I have a familiarity with it, I am able to see some details and subtle facets that I missed the first time or two through. More than the Chihuly stuff, gorgeous as it is, I am appreciating the beauty of the Arboretum itself – its design and vegetation. This trip, as always, I took a lot of photographs, which I will continue to force upon my helpless readers whenever I feel like it – or I can’t think of anything else to whine on about. So far, from this trip, here, here, and here, for example… with many more to come. But other than snapping photographs I wanted to find some spot to sit down with my Kindle and read for a bit, simply soak up the peaceful beauty. When I first arrived at opening, there weren’t too many folks there, but the crowd quickly grew. Now, there weren’t as many folks as there are on the weekends, not by a long shot, but they tended to cluster along the main paths, surround the more spectacular Chihuly stuff, and blabber on about this and that – generally messing with my chill. No problema, I expected this. It is a public spot – a tourist attraction – with a very popular special exhibit going on until November… I did not expect to have the whole place to myself. I had already decided to seek out a couple of hidden places, somewhere that I could sit, undisturbed, read a little, and generally chill out. Obviously, out of the main traffic areas. A nice bench to sit on. The first hidden spot is one I already knew about – I had spotted it the first time I came to the Arboretum. 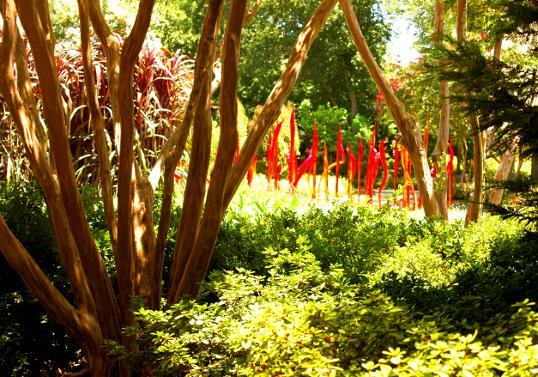 The first stage of A Woman’s Garden is a fiendishly designed series of formal gardens and water features that have a lot of Chihuly’s most spectacular glass works. It draws a big crown, oohing and ahhing and holding their iPhones up to send images back home to Aunt Emma who didn’t want to visit Dallas in the summer. What they miss are some clever, smaller bits of garden that jut off to the side, little isolated areas that really make the place special. One of these, sandwiched between the first fountain by the entrance to A Woman’s Garden and the Degolyer Mansion is called The Sunset Garden. It is a tiny path that goes up a bit of hill to a stone bench beneath a huge tree. As the name implies, the bench faces west and would be a great place to watch the solar orb sink beneath White Rock Lake. There is a little sign that directs you to the side garden – a sign that everybody, entranced with the colorful glass beyond, seems to miss. 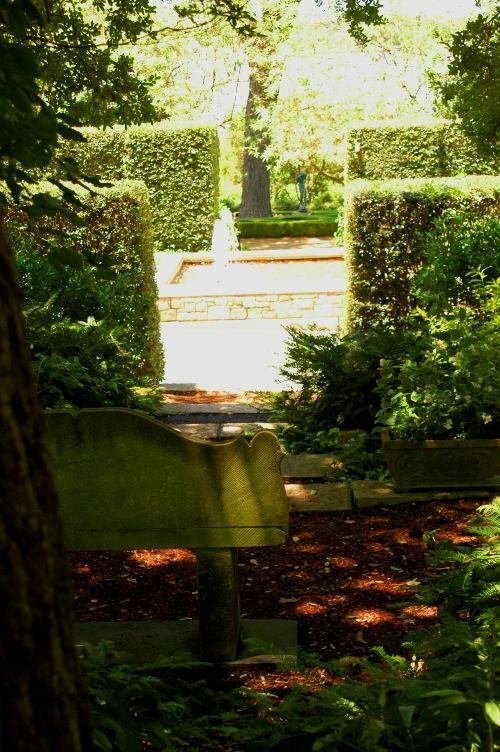 When you clamber up to the stone bench you look down through a gap to a fountain and then past into another small garden – The Pecan Parterre Garden, with a beautiful little sculpture – Harriet Frishmuth’s “Playdays” (more on that bronze piece in a few days, I promise). It is a truly idyllic spot. The path up to the stone bench in the Sunset Garden from the main entrance to A Woman’s Garden. A view of the Sunset Garden from the veranda of the DeGolyer mansion. 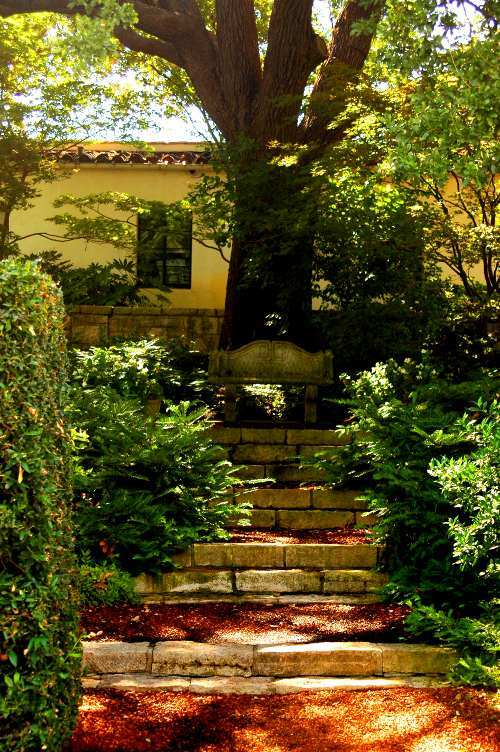 You can see the sun-drenched entrance to A Woman’s Garden and its fountain, and the Pecan Parterre Garden, with the little statue, beyond. White Rock lake is through the trees in the background – this would be a wonderful spot to watch the sun set. The only problem – as I discovered once I climbed up there and settled in – is that the stone bench is tilted out, ever so slightly, so it is not very comfortable. It’s like sitting in a church pew. I’m afraid that little detail makes the sunset garden a bit more useful to look at than to sit in for more than a few minutes. Later on, though, I found another little hidden spot that didn’t have any disadvantages at all. I was strolling through the Jonsson Color Garden (the big open ovals where some large Chihuly glass rears up) and looking into the strip of woods that separates that area from the Texas Town (a children’s area with small historical displays) and noticed a wooden bench set deep within the trees. I walked around a bit and found the path back there. It was perfect. 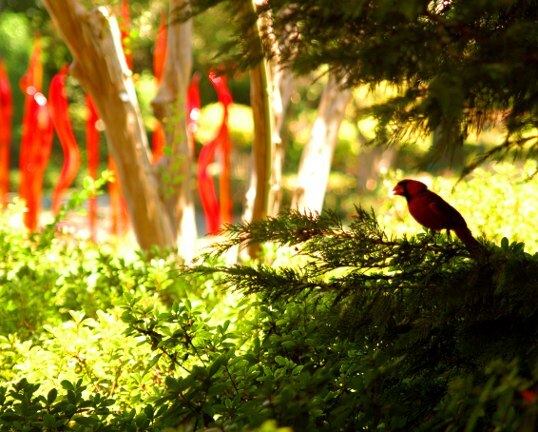 It sits in deep shade from tall overhead trees and is screened from the main walking path by a clump of Crape Myrtles. 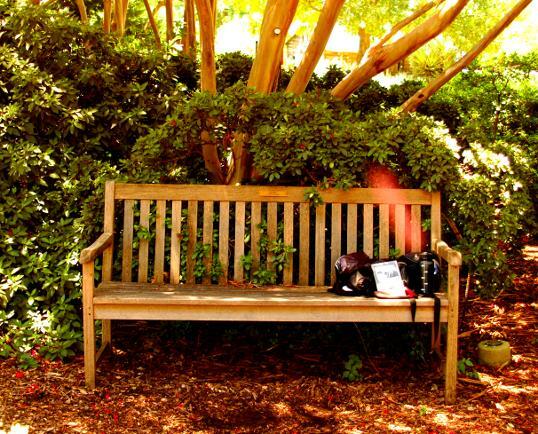 Cool and quiet – most importantly, the wooden bench is very comfortable. A perfect spot to sit and read (I cranked through an entire novel) and contemplate the universe. The view ahead and to the left from the little bench. These are some Chihuly red glass sculptures sitting along the edge of the Jonsson Color Garden. To the right from the bench is a bit of a view of Chihuly’s gigantic Yellow Icicle Tower. Here’s the bench, with my Kindle, camera case, and woefully inadequate water bottle. I had a little visitor while I was sitting there – somebody else trying to get out of the killer afternoon heat. It was too comfortable – I stayed too long into the stifling heat of the afternoon. The rest of the day I was dizzy and confused… even more so than normal. Still, I think I’ll go back. It’s a nice place… and there has to be some more hidden spots that I haven’t found yet. Maybe one with some burbling water nearby. Again, Visit Flickr for a larger and better resolution version. These are the sculptures that were damaged during the hail storm not too long ago. They look fine now. One of the most impressive sights in the Dallas Arboretum is the Magnolia Allee (along with the different, but equally gorgeous, Crape Myrtle Allee). 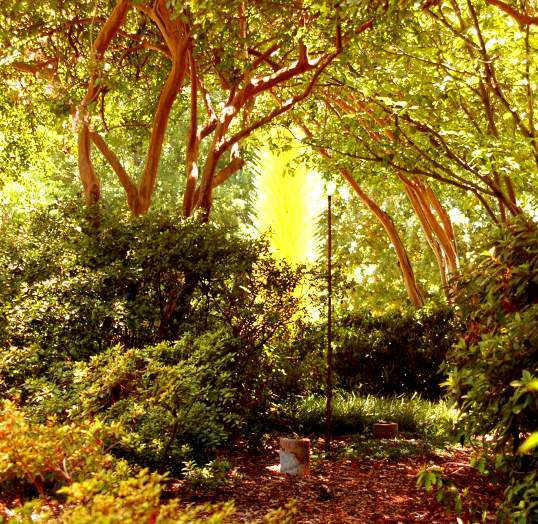 A long, straight, and narrow path runs between two walls of ancient giant Magnolia trees. This year, the fountain at the end is replaced by one of the larger Dale Chihuly works. It’s something to see, and even more amazing to walk down. I remember – 1979 or so, I was right out of school, living in Kansas, when I heard Sultans of Swing on the radio. It was a revelation. Years later, I think that Making Movies is one of the greatest albums of all time… a little disappointed with a lot of Dire Straights and Mark Knopfler’s later career… but still, Sultans brings it all back. This video is all amazingness – time goes by… everything changes and nothing changes. Check out the title for your book and see how it rates. I have two titles I’m thinking about… they both gave the exact same score… Still, the thing is kinda fun. Would You Live in These Tiny Apartments? 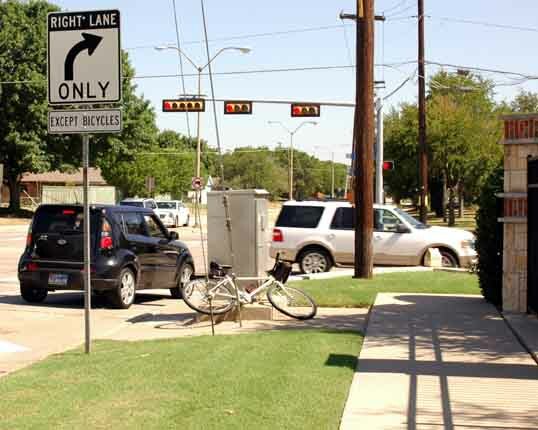 While Dallas rates, again, its well-deserved award as the worst city in the nation for bicycling, my suburb of Richardson was awarded the most bike friendly neighborhood. The best of the worst… so to speak. 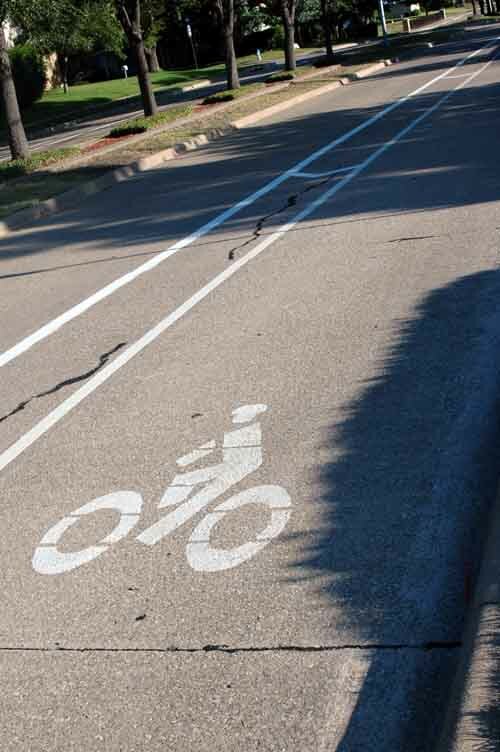 One piece of cycling infrastructure that Richardson has embraced is the idea of separate, striped, bicycle lanes on their broad residential avenues. The square mile neighborhood I live in, Duck Creek, is bisected north and south, plus east and west, at the half mile marks by two of these avenues – Apollo, going east and west, and Yale, north and south. In the last year or so, both have had a bike lane striped off going each way. These are marked off on the right hand side and are shared with bikes and parked cars. The square mile is also sliced on the diagonal with the Duck Creek Linear Park and its trail, plus the Owens Trail branching off to the north under the power lines, Glenville Trail heading west through the trails snaking around Huffines Park – my neighborhood is not lacking for bicycle infrastructure (love the Googlemap green lines for bicycle routes – though they don’t have the one’s on my streets). The city is expanding this program, and another road near me, Grove, has had the same treatment for at least two miles of its transit through the city. These improvements have been very popular. Not so much for the bicycle infrastructure they provide – but for their “calming” effect on traffic. These roads were wide enough to allow passing before – which only encouraged excessive speed, and a lot of folks were confused over which lane to drive in. Now the roads are narrowed to a reasonable width and seem to be the better for it. Recently the city improved the bike lanes in my neighborhood by adding a narrow “buffer zone” that restricts traffic a tad more and gives a bit of confidence to the bike riders. Bike lane on Yale, near my house. I’ve been experimenting with these lanes a bit over the last few weeks and have come up with a few opinions and observations. The lanes themselves are great. Sometimes, sharing the lane with parked cars can be a problem – wide vehicles like lawn-mowing company trailers can force you too far to the left, and there’s always the fear of someone opening a car door in front of you. The drivers do respect the lanes, though. The lanes would be tough for a high speed rider on a hot road bike – but a slow tourist or commuter has no problem in the middle of the blocks. One problem is the intersections. Left hand turns are harrowing on a bicycle – there isn’t enough sidewalk or shoulder to do the stop, turn, and cross. The cars use the bike lanes for right turns. Look at this picture. Bike lane merging with right turn lane at Beltline road. This is a very busy crossing and the cars are going by fast in all directions. There is simply not enough space to navigate a bike through there. If you ride a bike very much in traffic you will learn that bicycles are often invisible to turning cars – I am more afraid of cars making turns than I am of speeding motorists. Another observation is a more generic one. Planners tend to look at long stretches of road. If they can open up a long stretch, they view that as a victory. When you are planning a route for your own personal use you tend to think about choke points. These are locations or short stretches of road that cannot be easily or safety crossed on a bicycle. Your route will be developed not to take advantage of long stretches of good road as much as it is chosen to avoid these choke points. 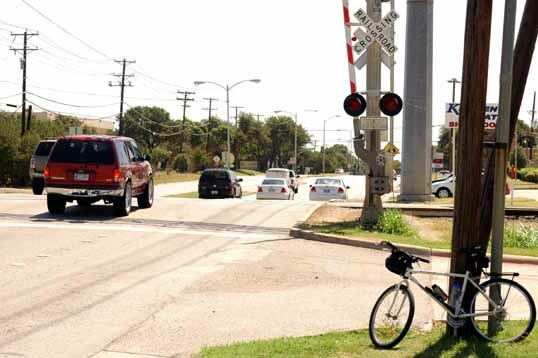 Some of the most notorious sets of these are the railroad crossings. Look at this one on Arapaho – a very busy major thoroughfare. Rail crossing on Arapaho road. There are three lanes of traffic both ways going through that little space – going fast, up to fifty miles per hour or more (don’t lecture me on speed limits… this is Texas). There is no sidewalk, no shoulder, no other way to cross. That hump has a set of rough wheel-swallowing steel rails sitting there on top of it. You hit that wrong on a bike and you are going down. There is no other crossing to the south for a mile. It’s two miles south to a safe crossing. The Grove road bike lane is right behind me… as is the Arapaho DART station. If I want to ride my bike to the library; I have to go through there. If there is any traffic at all I have no alternative than to stop, get off my bike, and carry it over the tracks. Which isn’t the worst thing in the world… but I wish someone would work on these choke points.